The Cuban All Stars Sampler Pack 30 cigars offers 30 cigars carefully selected for the cigar enthusiasts. Perfect to try different Habanos without buying a full box. 3 of each. 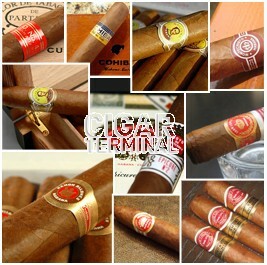 Cigar Terminal proudly presents Cuban All Stars Sampler Pack. This selection of 10 cigars contains top selling Cuban super stars of Cigar Terminal: Bolivar, Cohiba, Montecristo, Partagas, Romeo y Julieta, H. Upmann, Ramon Allones, Hoyo de Monterrey and Cuaba. Please note that we might need to at times substitute one or two of these with cigars with equal or higher value cigars due to stock availability, i.e. Bolivar Belicosos Finos, Bolivar Royal Coronas, Romeo y Julieta Wide Churchills, Hoyo de Monterrey Epicure No.2, Montecristo Petit Edmundo, San Cristobal El Principe, Bolivar Coronas Junior.